A life-long swimming enthusiast, Ciaran Gorman fully supports the campaign to re-open Broomhill Pool on the north-west side of Ipswich. Ciaran is the owner and operator of the popular Swimming Directory website 'Swim-Sites.com' as well as numerous other sports-related sites. He believes pools like Broomhill are national treasures that should be available to the British public. "Such facilities were fantastic amenities in the past and can be again." Swim-Sites features over 2,700 swimming sites and almost 2,000 swimming clubs worldwide. Log on to www.swim-sites.com/ to view Ciaran's Directory. 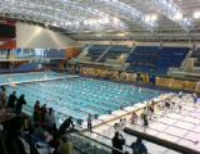 The photo shows the NAC pool in Ireland.